A few weeks ago, my twelve year old son started soccer in a fifteen and under division. Not only is he a rookie, but he is also at least a foot shorter than most of the other players. At a game last night, our team started the last quarter ahead by two. The goalie had done a great job but was tired of being in the line of fire. He took off the bright orange jersey and the gloves and tried to pass them off. No takers, until he got to my son. My heart stopped as I saw Isaac pull the larger-than-life jersey over his head and push his hands into the gloves. I was reminded of what he looked like so many years ago as he would follow his dad around the house, helping with repairs. He tried to fill boots that were too big and wear gloves that continually succumbed to the pull of gravity and headed for the ground. The game continued and the last quarter seemed to last a lifetime. The other team attacked our goal. Maybe they smelled blood. They were determined. Shot after shot. Those of us on the sidelines held our breath for minutes at a time. The whistle blew. Although our opponents had managed to get two goals past my son, he had thwarted another five or so attempts. The game was over and we had won. On the way home, I asked him if he volunteered to be goalie. He shrugged his shoulders and said, “No one else seemed to want to do it. And someone has to.” He had played goalie before. He knew the pressure. He understood that he would be standing alone. Protecting a large area and taking the heat first from his opponents and secondly from his teammates, should he fail. 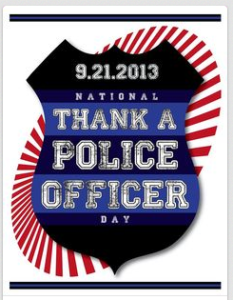 Today is a national day, set aside to say “Thank you” to a police officer. Life isn’t a game. But I can’t help but see some similarities. Everyday, police officers put on a different color. A color that set’s them apart from their opponents and from their community. They may not wear gloves but they wear a band of tools around their middle that remind them of the gravity of their position. They stand, often alone, between those who wish to score. And if they fail, they receive criticism and flak from their community. It is easy to forget that we are on the same team. That someone has to put on the bright orange shirt and gloves and stand against the opponents of liberty and freedom. Gratitude doesn’t mean we always agree with their decisions. Gratitude means we acknowledge the place they choose to stand. Say thank you to another human being who attempts to fill the shoes of men like Superman and Spiderman. They may not be superheroes but they are heroes none-the-less. And don’t be surprised if your “Thank you” is met with a similar response to the one my son gave. This entry was posted on Saturday, September 21st, 2013 at 7:30 amand is filed under . You can follow any responses to this entry through the RSS 2.0 feed. You can leave a response, or trackback from your own site. Well said! A big thank you to those serving our communities and those who have served! Tell your hubby we say thank you! Beautifully written and may I say, God Bless our police officers, and those who love them!